We get it. Replacing a roof is not what many people want to spend their hard earned money on. It is important to remember that homeowners do enjoy the benefits of having a sound roof over head every day. Your roof is debatably the single most important element of your house. If you don’t have a sound roof, the problems with your house are going to multiply rapidly. It protects everything under it and it needs to be done right. Should You Tear Off Your Old Roof? 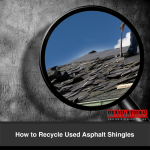 Many people are attracted by the idea of overlaying existing asphalt shingles, especially if the price quoted is lower and the contractor seems confident you don’t need to tear off your old roof. However, the truth is, so many variables have to be just right in order to make it work, that it’s much more likely to cost you money in the end. For a second layer to be as good as a roof tear off, you would have to have sound decking, no leaks and a roof with no sidewalls where flashing is needed in order to tie the tiles in to the exterior walls. If you don’t tear off the old layer, you can’t examine the decking. You can’t know for sure that there aren’t any soft spots or haven’t been any leaks. Remember, this is your one chance to make absolutely sure there are no problems with decking, and have been no holes made in your soffits or fascia. It’s not a good idea to skip that opportunity. In addition, if you overlay over existing shingles, you miss the opportunity to install an ice and water-leak barrier to your wood decking. If your existing roof is old, the barrier may not have been applied the last time your roof was replaced. It’s worth getting underneath to see. Ice and water barriers are a last line of defense against the damage wrought by ice dams in the winter. You never know when you’re going to get one of those, in spite of your best maintenance habits. Saving money is the name of the game with many home repairs. There are two ways of looking at it – scrimp and cut corners to save up front or do the job right and maintain it so you won’t have costs in the future. Adding another layer of shingles seems like it would save you money by not having to pay your contractor to tear off your old roof. A second layer is more difficult to install properly. I won’t speak to a haphazardly done job. You will get what you pay for with that. Doing a second layer right means a lot of prep work goes into the overlay anyway, and flashing (which, remember, is the most vulnerable point on your roof) is harder to guarantee. The savings you’re going to see may be in the range of a modest 25%. That second layer of shingles won’t last as long. That in itself eats away at the savings. You could be adding weight to your roof with a second layer that your house cannot handle. This is especially true if there is huge snowfall. Replacing your roof is a good opportunity to fix any underlying problems you might have. Find a reputable contractor who will do the job right and your cost will be up front. Contact us today.